Our thanks to Peter Jordens for bringing this information to our attention. The 17th Annual Bermuda International Film Festival (BIFF) is set to begin this Friday and today’s edition of The Royal Gazette includes the official 24-page guide to the week’s movies and special events, Owain Johnston-Barnes reports. This year’s festival, themed ‘Global Visions’, will run from March 21 to 27 and features a host of narrative, documentary and short films from across the world. Among the films to be screened at Liberty Theatre this week as part of the festival are Academy Award nominated films ‘Omar’, ‘The Square’ and ‘The Missing Picture’. 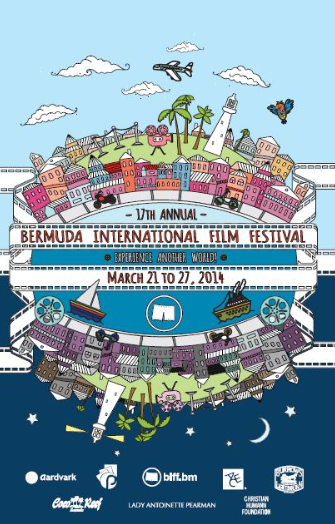 Along with international talent, BIFF will also highlight the work of Bermudian filmmakers, with documentaries ‘An Ancient Window’ by Robert Zuill, ‘Downing’s Wreck: The Story of the Sea Venture’ by Ben Watson and ‘Bullied Breeds’ by Gareth Fletcher all screening during the festival. And this year’s festival is set to remember Bermudian producer/director Arthur Rankin with its Prospero Award for lifetime achievement. Mr Rankin, who died in January at the age of 89, gained international recognition for his animated children’s holiday programmes produced with US partner Jules Bass, including 1964’s ‘Rudolph The Red-Nosed Reindeer’ — the longest-running, highest-rated special in the history of American network television. He wrote, produced or directed more than a dozen feature films during his career, including two feature-length made-for-television films shot completely on location in Bermuda: the 1978 cult classic ‘The Bermuda Depths’ and 1980’s ‘The Ivory Ape’.